St. Joseph of Damascus is one of the most significant and fascinating figures in modern centuries among Arab Orthodox Christians in Lebanon and Syria. At a time when there was virtually no Arab Orthodox education available in the Antiochian Patriarchate, and there were no Arab bishops nor competent Arab priests, he single-handedly created a school that produced 50 church leaders. Through his work he was extremely influential in bringing about the renaissance of Arab church life in the late-nineteenth century, of which our Arab-American Saint Raphael of Brooklyn was a participant and beneficiary. Although Father Joseph was the most knowledgeable Arab Orthodox priest in Lebanon and Syria, he was a very poor, humble parish priest, who served his flock with love and devotion, and gave his life for them as a martyr. Joseph Mouhana Al-Haddad was born in May 1793, the third son of a poor but pious family, originally from Beirut, Lebanon. The Lord instilled in him an intense desire and love for education and teaching. He obtained a little formal education while young, but his father could not afford the tuition, and Joseph had to go to work. Yet poverty and destitution could not dampen his thirst for knowledge. So the young Joseph worked all day, and taught himself at night, using his older brother, Moses’ books. Of course, education was inseparable from spirituality and theology, and the Bible was the most important textbook. He learned Greek and Arabic, and compared the texts of the Bible in both languages, thereby mastering translating to and from Greek, and also learned Hebrew to study the Old Testament. He used these linguistic skills to produce accurate Arabic translations till the end of his life. He studied Arabic, logic, the art of debate and right reasoning, literature, theology and history. While yet a teenager, he started teaching students in his home. His parents made him marry when he was nineteen, but this did not turn him away from his pursuit of knowledge. 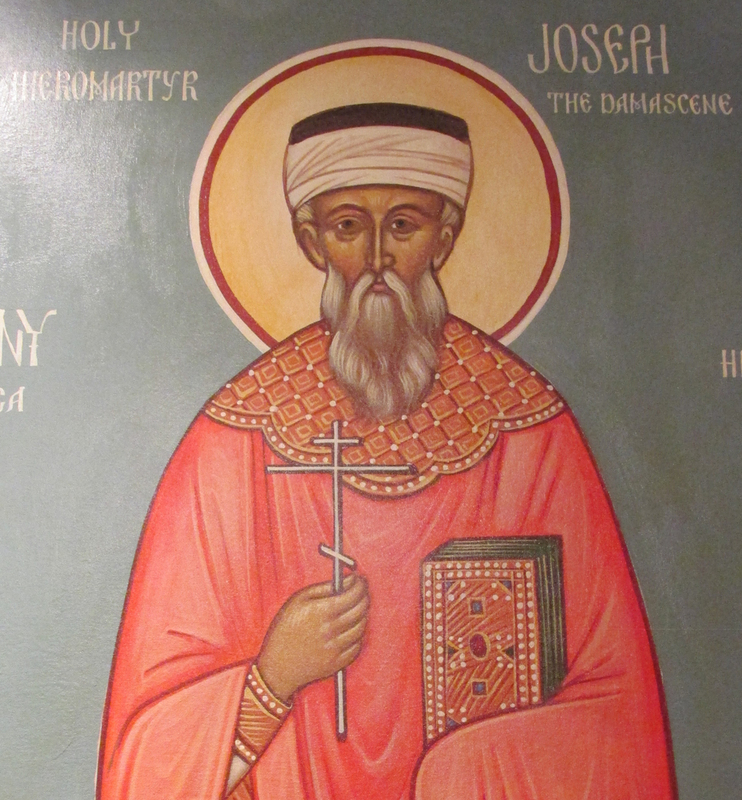 Because Joseph was known for his honorable reputation, godliness, fervor and knowledge, in 1817, at the age of twenty-four, the parish in Damascus requested that the young man be ordained as their priest. Father Joseph used his frequent preaching at the Patriarchal Cathedral as a means of instructing and guiding his flock in the Orthodox life, and was regarded by some as the successor of St. John Chrysostom. In addition to teaching in his sermons, he poured himself out with compassion to helping those in any kind of need. During the 1848 yellow fever epidemic in Damascus, he risked his life by ministering to the sick and burying the dead—without fear. In addition to his devoted pastoral care of his flock and his preaching, one of the greatest avenues of Father Joseph’s influence was his school. For 20+ years he had been teaching students privately. In 1836 he took over the Patriarchal School in Damascus, and transformed it into a first rate Arab Orthodox school, that attracted students from all over Syria and Lebanon. His chief concern was to educate the minds of Orthodox young men who could serve the Arab Orthodox Church, and to prepare men as priests who would have the education to serve their own people, instead of having foreign clergy. In 1852 he opened a department of theological studies, with the vision of elevating it to a level equal to other theological seminaries in the Orthodox world. He had twelve students during these eight years, all of whom became bishops. But his martyrdom in 1860 put an end to his dream. He breathed into his students the spirit of peace, success and righteousness that rippled out and spread throughout the Orthodox Arab community. He lived in extreme poverty, taking no pay for his teaching. He couldn’t be bought, and turned down very attractive offers to teach elsewhere, believing that God had called him to serve in Damascus. He was wise, patient, meek, humble, compassionate, righteous, and zealous in his faith. He could refute scholars using their language, and convince simple people of the Truth using their language. He was a scholar and a great theologian—the star of the East—and an example of righteousness and godliness. His printed works were numerous, specializing in translating and editing sacred, liturgical, theological and biblical texts, and the copying and correcting of manuscripts. During Father Joseph’s lifetime, Antioch was struggling for its survival. The Arab Orthodox Church was greatly weakened by the voracious work of Protestant missionaries and by the recent schism of the Melchites (former Orthodox who were pressured by Rome into becoming Roman Catholics.) Then, after 1724, the Orthodox hierarchs were foreigners, who did not understand the Arab struggles; there were no competent Arab priests, and no pastoral care. Constantinople and Jerusalem thought that the Antiochian Orthodox Church would disappear. In the midst of these challenges, Father Joseph blossomed as a new godly branch, the star of the East. Father Joseph’s life of sacrificial service was crowned by martyrdom on July 10th, 1860. When the Muslim massacre of Christians in Damascus started on July 9th, (the same massacre that caused the parents of St. Raphael to flee from Damascus to Beirut, where the future American saint was born a few months later), many Christians took refuge in the Father Joseph’s cathedral. Instead of fleeing, Father Joseph went to the cathedral and spent the night strengthening and encouraging the people to face martyrdom. The next day the cathedral was attacked and many of the Christians slaughtered. Father Joseph was recognized as the leader of the Christians, and brutally tortured and murdered. As he had dedicated his whole life to serving Christ, so he also followed Christ to his own Golgotha, and gained a martyr’s crown.